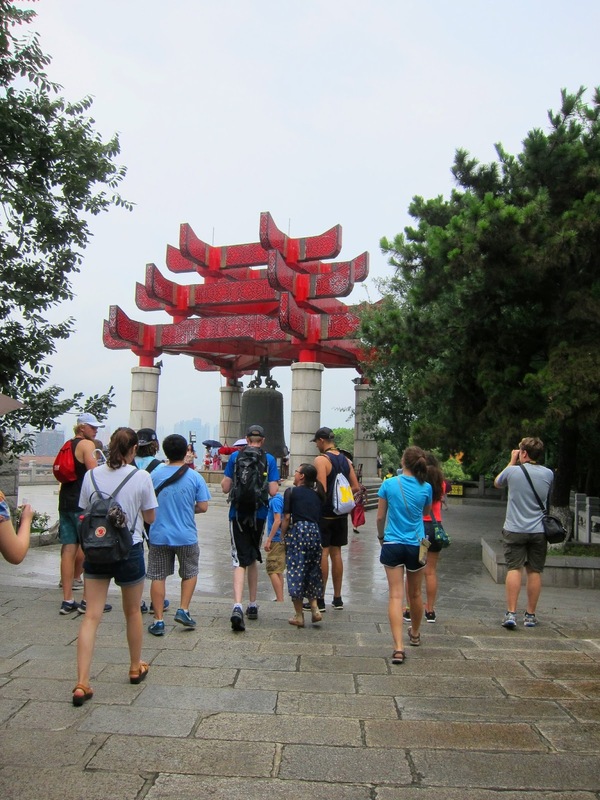 If you haven't been keeping up with me on social media or keeping up on the blog (both of which you should be doing), then you might not know that I recently went on a trip to China with a summer program. I did some social media updates while I was away, but I didn't really go in depth, especially because the wifi there was terrible and I had limited data usage while abroad. Luckily, it's time for a travel diary, where I go in-depth of my trip. I'll be posting a new travel diary every Wednesday until I've gotten through all of the content. This means that it'll go on for about 4-5 weeks, but Saturday content will still be the normal content, like outfit posts and lifestyle posts. This will be kind of a mini-series continuing until I finish covering the whole trip. 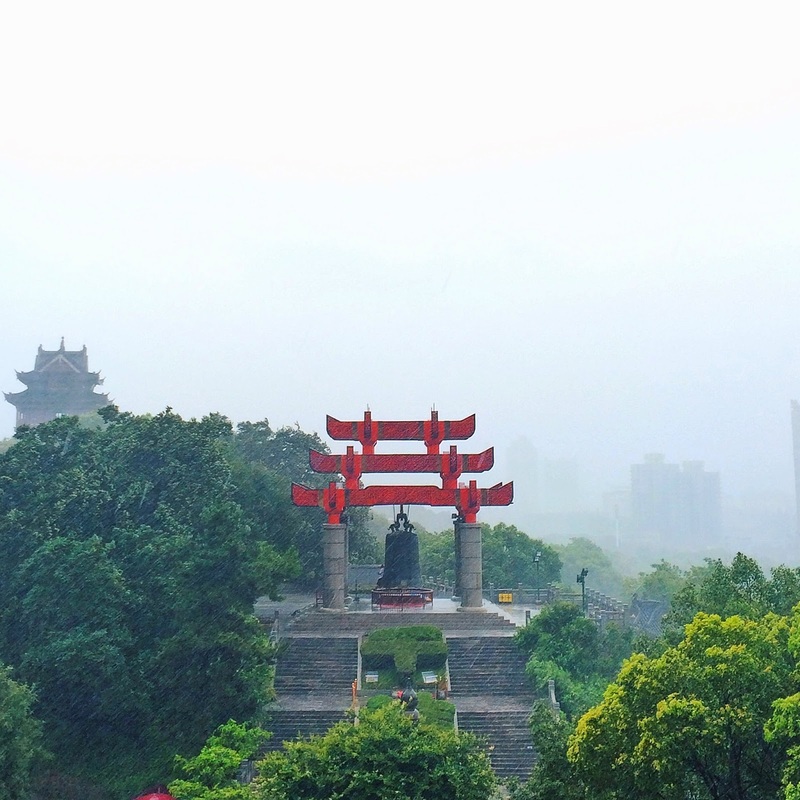 For the first travel diary, we're talking the Yellow Crane Tower. 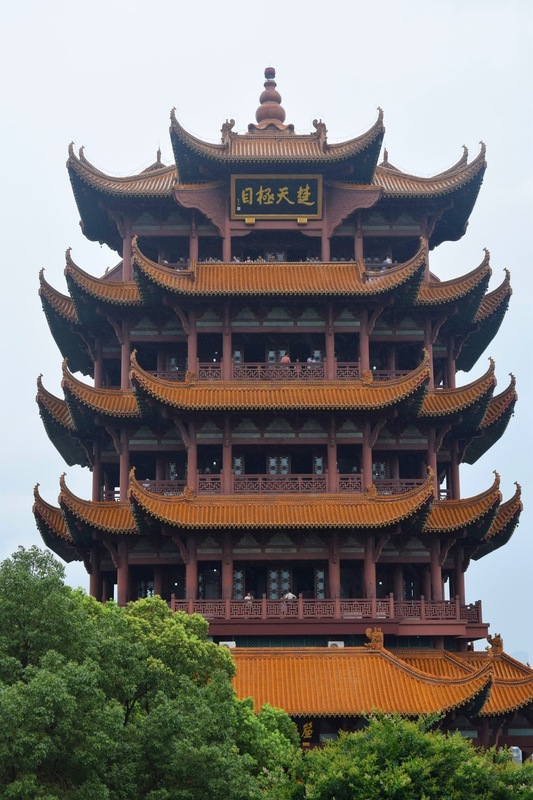 The Yellow Crane Tower is located in Wuhan, Hubei province. The five floor tower was rebuilt many times in a few dynasties. The one that we see today was built in the Qing dynasty, so it reflects the architecture during that time period. The sides are like wings, reaching up into the sky. And I bet you're thinking, "If it's called the Yellow Crane Tower, then why is it not yellow?" There's actually an ancient legend about how the tower came to be, also explaining the name. On the day that we visited the Yellow Crane Tower, it was so rainy that the skies were practically white, as you can probably tell from the pictures. It was windy and pouring, but it was still so much fun. On each floor of the tower, the view was very similar, which you can guess from the layout of the tower, but inside the tower they had little themes. For example, there was a tile mural of a Yellow Crane Tower on the first and second floor, while there was also some scale models of the tower in each dynasty, so you could see how each dynasty changed it. 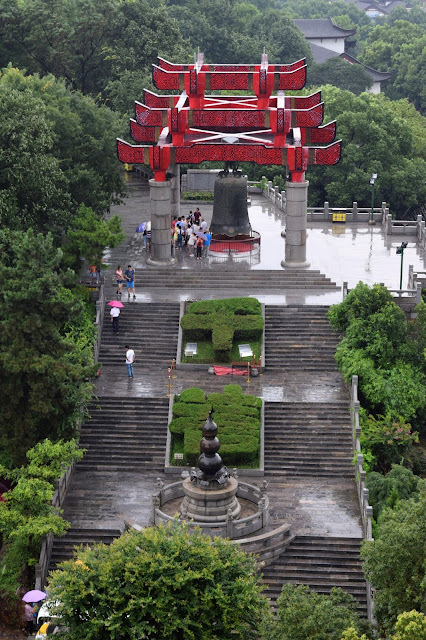 The tower is also placed by the Yangtze River, which you can partially tell from the picture below. 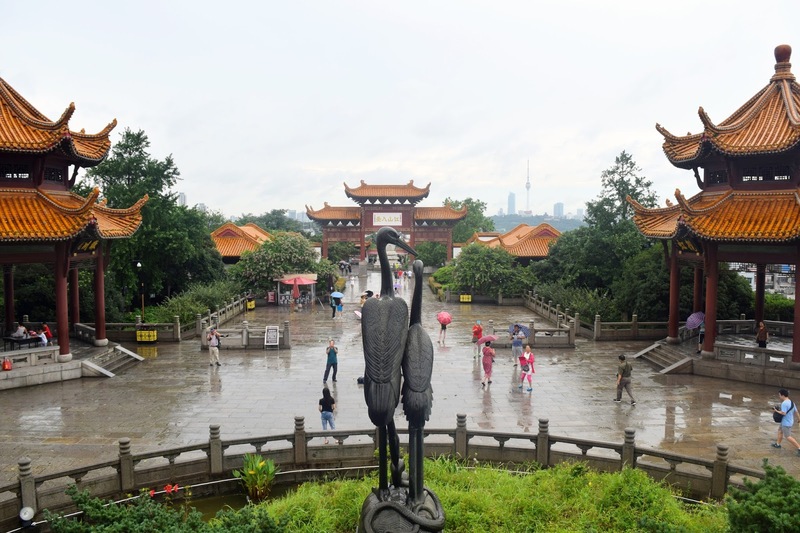 From the tower, you could see the bridge across the river, the city, and also the pavilions and yellow crane statues that surround the tower. While it was difficult to see the view through the rain, it was still a really nice view, not to mention how great the wind felt on the humid day. After all, Wuhan isn't known to be the "oven of China" for nothing, and the wind on top of the tower was just what I needed to cool off, which was something that I wasn't able to do too often. If you ever get a chance to visit Wuhan, I would definitely recommend the Yellow Crane Tower for sightseeing, it's definitely a pretty iconic building in the area. Obviously, it's no Great Wall of China, but it's still a great tourist attraction in the province. 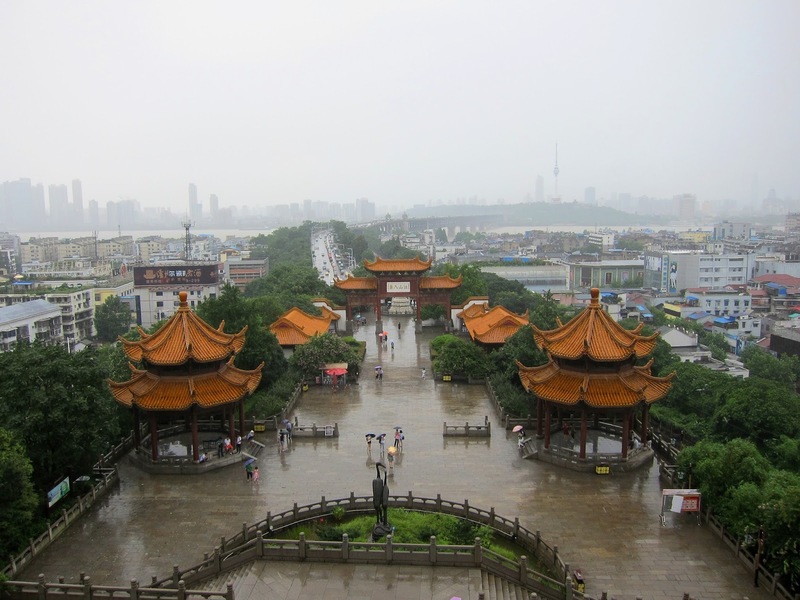 Since I spent most of Wuhan doing activities with the summer program and mostly in classes, next Wednesday we'll be taking it to Beijing, China for the travel diary series. We'll be starting at the Temple of Heaven and then working our way through from there. Stay tuned next Wednesday for a continuation! Love this so much!!! I'm excited to see more! Good job!